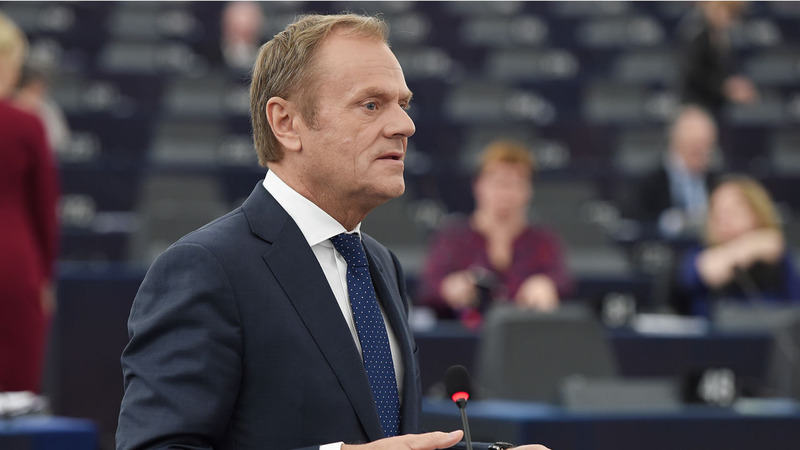 European Council President Donald Tusk urged EU lawmakers Wednesday to remain open to a long postponement of Brexit while Britain rethinks its position, urging them not to “betray” the UK’s pro-Europe voters. “I said that we should be open to a long extension if the UK wishes to rethink its Brexit strategy, which would of course mean the UK’s participation in the European Parliament elections,” Tusk said. “And then there were voices saying that this would be harmful or inconvenient to some of you. Let me be clear, such thinking is unacceptable,” he told the Strasbourg assembly. At last week’s European summit, EU leaders agreed to delay the day of Britain’s departure from the bloc by three weeks until April 12, while Prime Minister Theresa May struggles to ratify a withdrawal treaty. But many on the continent — most vocally France’s President Emmanuel Macron — oppose a longer extension, concerned it would disrupt the European Parliament elections that start on May 23. If Britain is still an EU member on that date, it would have to take part in the vote, and wrangling over Brexit would continue to disrupt the European political agenda for months or years to come. Tusk, who stressed he was expressing his personal view, urged the European parliament to keep faith with those British voters still hoping for a longer delay or even the reversal of the Brexit decision. “You cannot betray the six million people who signed the petition to revoke Article 50, the one million people who marched for a people’s vote or the increasing majority of people who want to remain in the European Union,” Tusk declared, to cries of “rubbish” from eurosceptic British MEPs. Hundreds of thousands of pro-European British voters marched in London on Saturday, and an online petition hosted by parliament calling on the government to cancel Brexit has gathered 5.8 million names. “They may feel that they are not sufficiently represented by the UK parliament, but they must feel that they are represented by you in this chamber, because they are Europeans,” Tusk said.